The Rock Pub has been around for 23 years now and is about to celebrate its 24th anniversary next March. It has been known for the reputation of the great music it provides for rockers from all over the world. 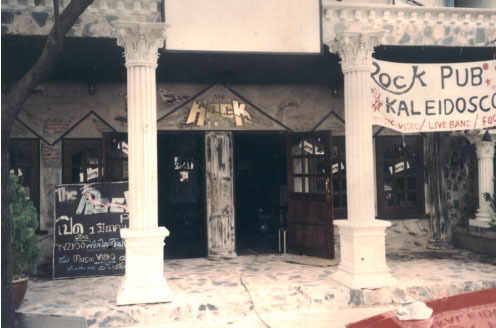 For over 2 decades, more than 40 rock bands had stepped on the Rock Pub's stage and performed. Over dozens of those bacame famous in Thailand's music industry, one of the reason they all had agreed for their success is the experiences they gained from playing here night in and night out. Great artists from all over the world also played at the Rock Pub. NAPALM DEATH, SODOM, DRAGON FORCE, DORO, EXODUS, MR.GARY BOWDEN, and KING LYCHEE (Hong Kong) are just some of the great bands that put on powerful performances here, at the Rock Pub. Now, Imagine if you have a 23 year old child, the Rock Pub has seen and gone through different paths. The economy shock 9 years ago almost put it out of business but it stayed strong as the musicians and customers supported and stood by during tough time. The Rock Pub is the only place for rockers to enrich themselves with great music, without it Thailand's rock industry could be in jeopardy, this is why the Rock Pub had lived for 23 years and will continue its plan as long as there are still rockers left in this planet!!!. Every 1st of March for 23 years, rockers from all over Thailand had always gathered up and celebrated each year that passed on, meaning that the Rock Pub had added 1 more year to its great history. So are you ready to be a part of this? Please come enjoy yourself with the best music in Thailand, surely a true rocker cannot miss!! !